OK, this review is overly long. But it’s a big book, and there’s a lot to talk about; not only with the seven episodes, seven story arcs, and host of main characters, but with the innovative way the author is using the digital book form as well. First the story; almost 800 pages of it. (Though to be fair, there’s a lot of detailed background stuff at the back and you don’t have to read all that.) It’s worth it. I just pretended I was reading three books in a row and was perfectly happy. This book is well written and well edited. It really has to be, to hold all the detail of what’s going on in the story. And it’s an interesting story. 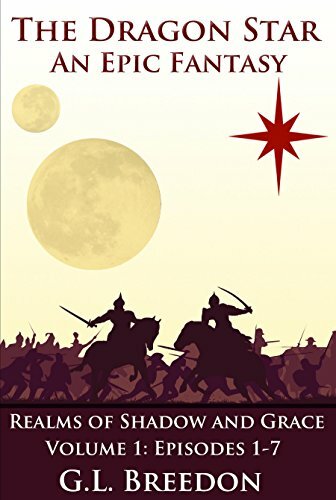 This is a sweeping fantasy, intricately plotted, with varied and detailed characters ranging all across the large world the author has conceived. The basic premise is that about 10% of the world’s population suddenly starts to have the same dream of a new religion forming around a new goddess. Then, as shown in the dreams, a new, red star suddenly shines in the night sky for all to see. Unsurprisingly, these strange events set off a variety of different storylines across the world. Some ignore the dreams, many pretend they aren’t having them, some embrace this new religion, and some hunt down the dreamers as heretics. And away we go, following seven main storylines and a dozen or so characters as they weave around the world, occasionally crossing paths but often having very little to do with each other. Here’s the part where this book becomes unique. You can read the book, like any other book, front to back. That’s how I started. But I’ve got to tell you, it annoys me when each chapter moves on to another storyline. At the end of each chapter I’m forced to give up on the people whose story I just got interested in and switch my brain, reminding myself again who this new set of characters are and what they are doing. Then I get going with the new storyline and… Argh! The chapter ends and I’ve got to take up a whole new cast and plot! The solution to this? Digital media to the rescue! The author has taken what I believe is an important leap forward, using the digital book to his advantage. If you reach the end of a chapter and don’t want to switch to a new storyline, guess what? You don’t have to switch! Just follow the link at the end of the chapter and the book zips you to the next installment of that same storyline. Or, to get even more specific, there are also links at the end of a chapter to follow a specific character if you get really into one person. Practically speaking, this technique has its pluses and minuses. I did follow some of the individual storylines and I enjoyed not having to leave the people I was interested in. I liked that. There were a few hitches, though. For example, in one storyline I followed, I moved on to the next occurrence of the storyline and was dismayed to learn that somebody had been assassinated, and I hadn’t read that bit; turns out their assassination was told from the perspective of a character in a different storyline. That was kind of disconcerting, but overall, I liked the technique. Usually the storylines stayed separate enough that following one to the end didn’t ruin the surprises in another storyline. So to sum up: This long, well-written and very complex book is worth the time, not just for the story, but to experience the new things the author is doing with the digital book format. Honestly it’s four stars for the story, and one extra star for advancing the art form.